Your FRITZ!Box establishes a connection to the mobile network as soon as you insert your SIM card and enter the PIN in the FRITZ!Box user interface. This can take up to 2 minutes. During this time, the "Power" LED on the FRITZ!Box flashes and then stays lit as soon as the connection has been established. The FRITZ!Box's "Power" LED flashes continuously and you cannot connect to the internet. Important:If the FRITZ!Box does not establish a DSL connection, proceed as described in this guide. If the FRITZ!Box user interface cannot be opened, follow the instructions in our guide FRITZ!Box user interface cannot be opened. If the FRITZ!Box shows that the LTE connection is established intermittently and always drops again, follow the instructions in our guide FRITZ!Box reports that the LTE connection drops frequently. Unscrew the LTE antenna located under the SIM card slot. Press the SIM card briefly to remove it from the SIM card slot. Check whether it is the mini-SIM (25 x 15 x 0.76 mm) SIM card you received from your mobile network operator and that the contacts are not damaged. Important:Do not use any micro or nano SIM cards that have already been punched out and inserted into a SIM card holder because they can get jammed and damage the SIM slot. If it is not the mini-SIM card you received from your mobile network operator or the contacts on the SIM card are damaged, contact your mobile network operator. Insert the SIM card into the SIM card slot with the slanted edge of the card on the left and the contacts facing downwards (see fig.). Push the SIM card into the SIM card slot until it clicks into place. A few millimeters of the SIM card protrude from the SIM card slot. Click on the "Internet Connection" tab and then on the "Mobile" tab. Enable the option "Permit roaming". ATTENTION!Enabling roaming could result in additional costs. Refer to your LTE provider for information on roaming and possible costs. In the section "Type of mobile communication", enable the option "Manual" and disable the option "UMTS". If you are now no longer able to connect to the mobile network, reenable the option "UMTS" and click "Apply". Enable the option "Use previous software version for the integrated mobile communications modem". Click "Apply setting" to save the settings. Now the FRITZ!Box enables the previous modem version and reinitializes the modem. Afterwards, the FRITZ!Box attempts to establish a mobile connection again. Check the pin in the connector of both LTE antennas. If the pin is bent or has broken off, there can be no contact between the LTE antenna and the FRITZ!Box. Make sure that both of the LTE antennas included in the package are correctly screwed onto the sockets labeled "LTE" on the FRITZ!Box. Swap the LTE antennas connected to the two LTE antenna sockets on the FRITZ!Box. 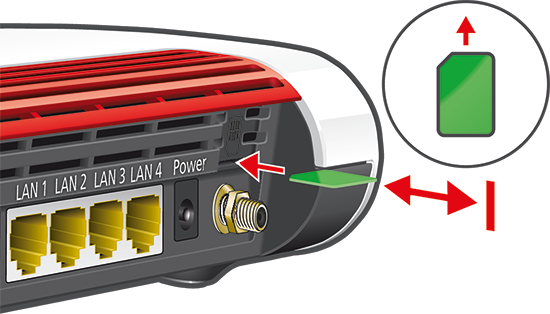 Check whether the FRITZ!Box can then establish an LTE connection. If you are using an outdoor LTE antenna, check whether you can establish an LTE connection if you use a different outdoor LTE antenna or a different LTE antenna cable. If you can establish a connection then, either the outdoor antenna or antenna cable is not suitable or is defective. Note:If you are using the FRITZ!Box in the indoor coverage area of your LTE provider, test whether you can establish an LTE connection if you use the original LTE antennas included in the package. Note:Internal LTE antennas may not be sufficient for an LTE connection if you are using the FRITZ!Box in the outdoor coverage area of your provider's radio coverage. Your LTE provider can tell you whether you are using the FRITZ!Box in their indoor or outdoor coverage area. Connect an outdoor LTE antenna to the FRITZ!Box. Note:If you are using the FRITZ!Box outside of the outdoor coverage area of your LTE provider, outdoor antennas on the balcony or roof may also not be sufficient for your LTE connection.